11 Search Results for "#Project Risk Management"
Client: We can give you this project but you have to deliver it in 6 weeks… coz we have to showcase it at an upcoming trade show. Boss: Yes don’t worry ! We shall finish this project in given time…even if it means working all night or even on the weekends! Project Manager (thinking): What!?! Is he out of his mind? It’s time to put some sense in him! Project Manager: pssst…Boss! 6 weeks seems little unrealistic…We have not even gathered the user requirement, we don’t know the scope of work and we don’t even have enough resources to work on this! Boss: Don’t sound pessimist or we may lose out on this project…Take this as a challenge, it will be good for your career growth. Project Manager (thinking): I don’t know about the career growth but I surely will regret choosing this as a career path. Start a project on the right foot by having enough resources right from the get go. Get expert advice from people who have worked on similar projects. Without this information the project is less likely to succeed. Boss: Team, here is the plan for our new project. It may look complex at first but I assure it will guarantee project success. Any comments on the plan? Team Member A: psst... Why am I having a deja vu at this point of time? Team Member B: That's because he is showing us the same project plan we used for our last project. And as you know, that was a success. Team Member C: I have read the project scope and charter for the new project and this plan may not work. Project Risk Management All projects are unique and although they may have common characteristics, different projects need to be managed in different ways. "One Size fits all" approach may not work. Boss: There is this new technology that's making news so I suggest that we use it in our ongoing project. What do you think? Project Manager: But, err.. This project is halfway through and moreover, we do not have the expertise who can use it, they may need training. Boss: Oh Come on! You are sounding so archaic ' and 'Stuck-in-the-Mud' Project Manager: (thinking) And what if the project gets stuck in the mud! Project Risk Management Relevance and applicability of new technology to a project has to be researched to check its impact on team's ability to get work done. If it benefits then proper training to be provided. This will help mitigate risks associated with usage of new technology. Project Manager: Thank you all for coming to this Kick-off meeting! I am going to keep it as simple and short as possible. And hence... this one is going to be a NO-AGENDA meeting Team Member: But we need clarity on the project objectives, timelines, our roles in it, and the overall approach! 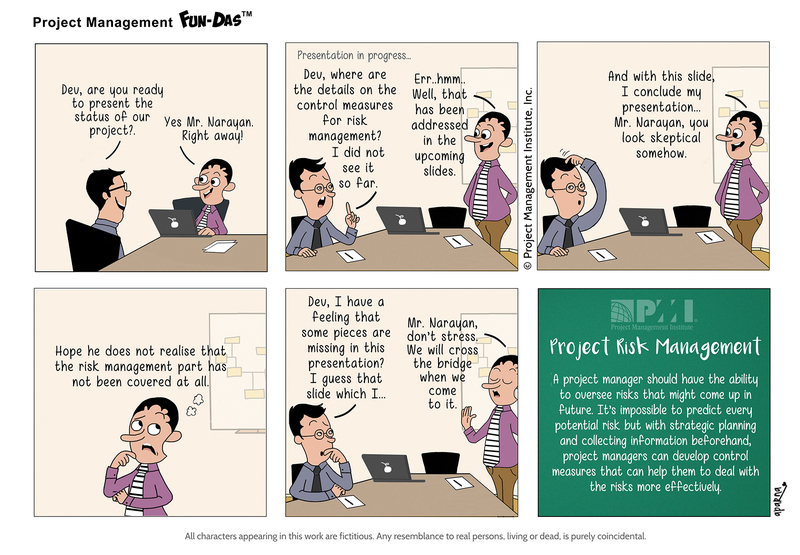 Project Manager: Remember! It's a No-Agenda meeting... so no questions or queries will be entertained.. or else it will affect the flow and pace of this meeting... Hope you understand. Team Member: (thinking) But you are failing to understand that the pace and flow of this project may get affected! Project Risk Management All team members need to have clarity on their roles, responsibilities, key project milestones and deadline dates. Otherwise the project runs a risk of not meeting customer requirements and eventually project failure. Project Manager: Our Senior Test Lead has quit the company. So I want you to fill in for him till we hire a new recruit. Team member: But....err...I am the Techical Architect. I don't know anything about testing. Project Manager: Your performance appraisal is due next month, isn't it Mr. Dependable? Team member: (thinking) Looks like there are "Testing Times" ahead, for me. Project Risk Management Draw up Contingency Plans to control the impact of risk related to resource scarcity, which may lead to project failures. Boss: Team, I would like you to meet our new Project Manager for "Skating on Thin Ice" project. Boss: He has no experience in this field, but he is keen to learn the ropes in his new profile. And I expect you all to respect his learning curve. Team: (thinking) Dooms Day!!! Project Risk Management Build a team based on required skill sets and experience and not the availability of resources, as that could put the project at risk. Team Member: Boss, here is the new plan for our project. It gives us a clear project time estimation. 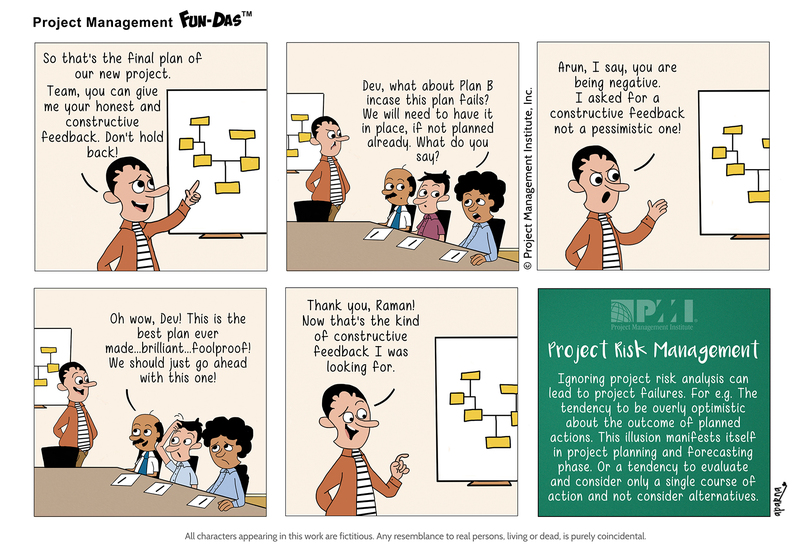 Project Manager: Nah! It doesn't look reasonable to me. C'mon, you have done this project before. Come up with a plan with shorter timeline. Team Member: Here is the "reasonable" plan you had asked for! Project Member: Now that's what I call an optimistic yet realistic plan! Well done! Project Risk Management "The Planning Fallacy" is the tendency to undervalue the time, costs, and risks of future actions and overestimate the benefit of those actions. The results are time and cost overruns as well as benefit shortfalls. Boss: I want the list of 'specific' unknown risks that may arise in our project, ready in an HOURS TIME!!! Project Manager: But....err...Sir... Some time later... Boss: What on earth are you doing in that attire? Project Manager: I am trying to source my SUPERPOWERS to get the list done in an HOUR...Sir! Risk Management RISK REGISTER-A living document, created at the onset of the project and to be updated regularly.